I went to the local farmer’s market over the weekend and got a huge basket of locally grown, farm fresh fruits and vegetables. I could clearly notice the difference between the zucchinis, blueberries, strawberries and cauliflower which we got in the market and which we usually get from the grocery stores. The zucchini especially looked so firm and fresh. I tried a couple of new recipes with it and for the leftover wanted to bake something for my sister-in-law to take back home with her. I had some ripe bananas too. So wanted to incorporate both bananas and zucchini in the recipe. It had to be easy to pack and carry with her. Either zucchini bread or muffins seemed to be a good option. 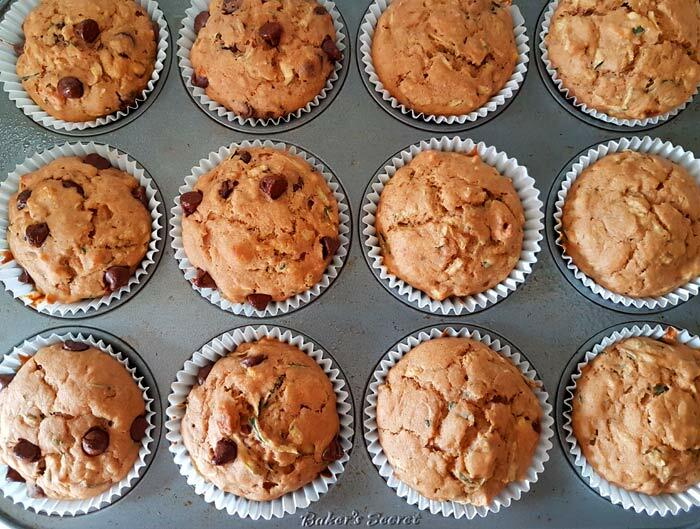 I have a double chocolate zucchini banana muffin recipe here already. Since my sister-in-law is not much of a chocolate fan, so went ahead and made these plain, no egg zucchini banana muffins. I added chocolate chips for one half of the batter for the kids and chopped walnuts for the other half. You may choose to add either one or both to suite your needs and taste. 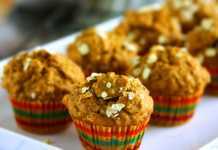 How To Make Vegan Zucchini Banana Muffins? 2. 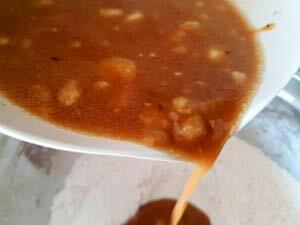 Stir in wet ingredients. 4. Stir in wet into dry. 5. Add the grated zucchini. 6. 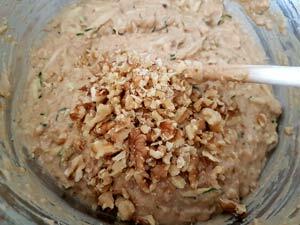 Mix walnuts in one half. 7. 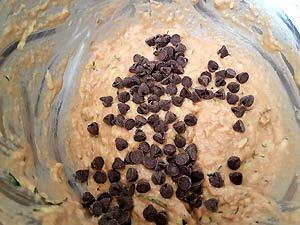 Mix chocolate chips in other half. 10. Bake for 23 mins. Click here for more zucchini recipes and banana recipes. 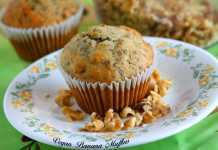 These whole grain, zucchini banana muffins make a perfect lunch treat or after school snack. This recipe is versatile because zucchini can be substituted with any other vegetable or fruit of your choice. Preheat the oven to 375F/190C. 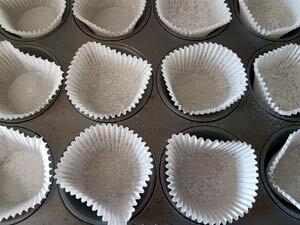 Line a muffin tin with paper liners and lightly grease it with non-stick cooking spray. Grate the zucchinis, squeeze the water our in batches and reserve the water. 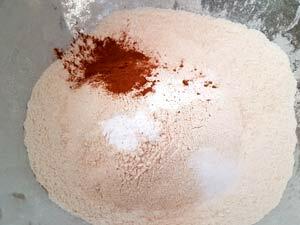 In a large bowl sift together the dry ingredients and keep it aside. 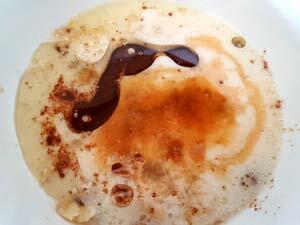 In a measuring cup, measure almond milk and stir in the vinegar and mix well. Let it curdle while you mash the bananas and mix the rest of the ingredients listed under the Wet Mix in a medium size bowl. 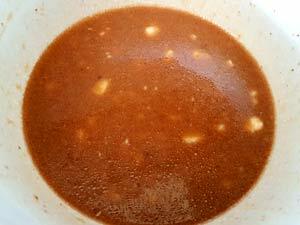 Once the almond milk looks curdled mix in that too. Sometimes it might not look curdled, but that’s fine. Just go ahead and stir it in. 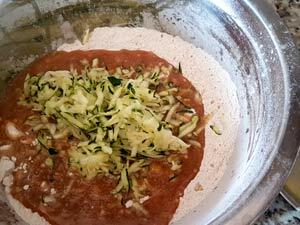 Add the wet mix into the dry flour mix and also the shredded zucchini. Mix together. If you feel the batter is a bit thick add the reserved zucchini water like I did. If you don’t have the water add plain water/milk in small increments. Once the batter is ready, add in the chocolate chips and/or walnuts. I divided the batter in half and added chocolate chips in one and walnuts in another. You can add both as well. 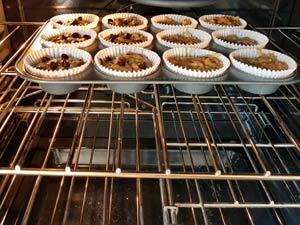 Scoop out about 1/3rd of a cup of batter and fill out the lined muffin tin. Top it with chocolate chips/walnuts. 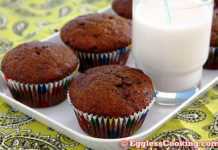 Bake for 20-25 minutes or until a toothpick inserted in the center of the muffin comes out clean. Remove from oven and let it cool on a wire rack for at least 10 minutes. After that remove the muffins from the tin and cool it completely on the rack before storing it in an air tight container. 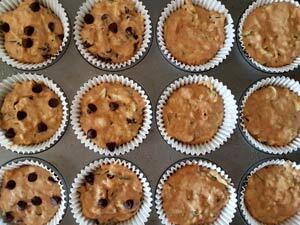 These muffins should store well in the freezer. nice post dear and your dish is so delicious thanks for sharing…….